Accepting the Panjwani Committee Report that said the situation in Bengaluru was nothing short of environmental emergency, the National Green Tribunal (NGT) has directed the Karnataka government to transfer Rs. 500 crore in an Escrow Account to execute action plans for rejuvenating the Bellandur, Agara and Varthur lakes in the city. The apex environmental court has further ordered the Karnataka government to furnish a performance guarantee of Rs. 100 crore to execute the action plans by June 30, 2019. The tribunal has directed the state to deposit Rs. 50 crore as interim environmental compensation with the Central Pollution Control Board (CPCB), holding that in the event of delay, an interest of 12 per cent shall be payable. A penalty of Rs. 25 crore has also been levied on the Bruhat Bengaluru Mahanagara Palike (BBMP), which, too, shall have to be deposited by it with the CPCB. A bench of Chairperson, Justice Adarsh Kumar Goel, Justices S.P. 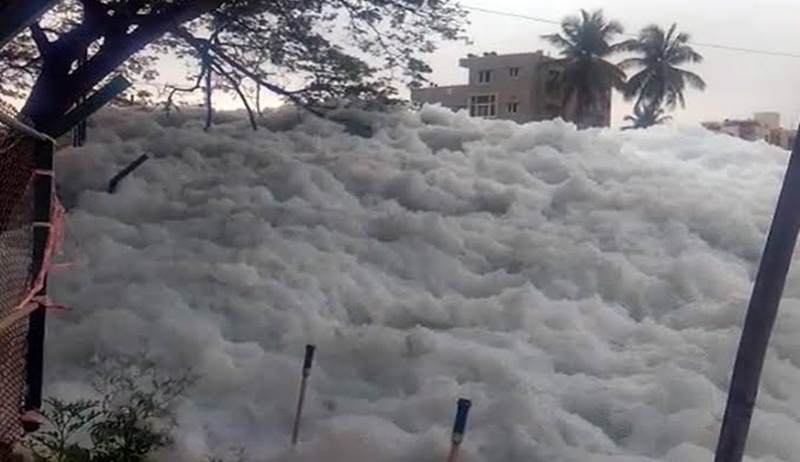 Wangdi, K. Ramakrishnan and Expert Member, Dr. Nagin Nanda, passed the orders after taking a stern view on the high volumes of untreated sewage and industrial effluents falling in three of Bengaluru’s biggest lakes -- Bellandur (around 130 years old and spread across 9000 acres), Varthur (spread over 439 acres, with catchment of 279 sq. km and 96 cascading interlinked lakes) and Agara -- and the state government’s failure in reining it. The court had earlier taken cognizance of several media reports showing massive foam and froth rising above the lakes’ waters and fire incidents arising therefrom. “It is obvious from the resume of the facts and reports noted above that there is a failure of very high magnitude on the part of the State of Karnataka and its authorities, including the BBMP, in protecting the three lakes and also in keeping the Rajakaluves (drains) joining the lake clean and free of encroachments,” the tribunal held. “The local bodies have been entrusted the duties specified in 12th Schedule to the Constitution, read with Article 243W. The 12th Schedule includes the issues of public health, sanitation, solid waste management etc. Inspite of comprehensive statutory framework, the State of Karnataka as well as the BBMP, even after repeated orders of this Tribunal, have failed to perform their duties,” the bench said. “The State is a trustee of all natural resources which are by nature meant for public use enjoyment. Public at large is the beneficiary of the sea-shore running waters, air, forest and ecologically fragile lands. The State as a trustee is under a legal duty to protect the natural resources. The authorities responsible have equal liability to pay compensation for restoring the damage to the environment and to prevent further damage,” the order passed on December 6, 2018, read, adding that “Pan-India, environment degradation is severely affecting public health on a large scale”. “Inspite of admitted grave situation, the State/BBMP have not taken any coercive measures against polluters of the concerned officers for their failure. No prosecution is shown to have been launched. No serious steps are shown to have been taken to remedy the situation,” the green court said. The directions are passed in a case registered suo moto by the Tribunal on the basis of media reports of toxic fumes and froth appearing in the lakes, owing to alarming levels of unchecked pollution. “The catchments of the lakes as well as the Rajakaluves were all but encroached. All this was posing serious environmental hazards to the people of the city. The court took note of our submissions,” Jain said. The Panjwani Committee Report stated that around 183 MLD (million litres per day) of untreated sewage was being discharged into the lakes. The NGT directed that the recommendations made therein may be carried out to ensure that no polluted waste was discharged into the water bodies and no solid waste dumped therein. The suggestions made in the committee pertaining to the removal of encroachments from the catchments shall also be acted upon. The KSPCB (Karnataka State Pollution Control Board) has also been asked to install Real Time Water Quality Monitoring Systems in the three lakes, while the state may use drones and satellite imageries to monitor activities around the lakes. In order to implement the committee’s recommended actions, the tribunal also constituted a monitoring committee headed by former Supreme Court judge, Justice Santosh Hegde. The panel would also have senior Scientist of the Indian Institute of Science, Prof.. T.V. Ramachandra, and representatives from the CPCB and KSPCB. Of the Rs. 25 crores the BBMP has to submit with the CPCB, Rs. 10 crore shall be transferred to the KSPCB for providing logistical support to the Justice Hegde Committee. The tribunal has asked the CPCB to frame guidelines and regulations denoting the scale of penalties to be imposed and the amounts to be recovered from individuals or authorities for failure to comply.